If your company produces any kind of medical waste, then you know that it’s essential that you hire a professional Medical Waste Disposal company, like Pacific Medical Waste, to get rid of it for you. Whether it’s regulated bio-medical waste, bio-hazardous waste or pathological waste, you cannot take any chances with choosing a company that won’t satisfy all of your business needs. Using a professional and client-focused company for your Medical Waste Disposal in California is just the smarter choice. Pacific Medical Waste is a locally owned and operated company serving all of California. Inflexible Pickup Schedules – National medical waste disposal company seldom change their pickup schedules to meet your needs, because doing so would cost them money. Unfriendly Service Representatives – In industries such as medical waste disposal where one large company has historically dominated the market with little competition, these companies don’t insist that their representatives provide excellent customer service because they think their customers have no other option. No Service Guarantee – National medical waste disposal companies don’t offer any service guarantees. If you’re not happy with their service you still have to pay and you’re stuck paying them for the duration of your agreement. Flexible Pickup Schedules – If you have a specific service request Pacific Medical Waste will adjust our pickup schedules to meet your needs. Immediate Responses – One of our local service representatives will immediately respond to any service request you make and provide a solution within 24 hours. 100% Satisfaction Guarantee – If you’re not happy with our service, let us know and we’ll make it right. If you’re still not satisfied, we’ll refund your service fee. Charge Up To Twice As Much – On average, national medical waste disposal companies charge 20% – 30% more than Pacific Medical Waste. However, some national medical waste disposal customers are paying twice as much as they should for these services. “Mystery” Fees – Many national medical waste companies will quote you a low-low rate and then slam you with “mystery” fees you’ve never heard of, like administration fees, environmental fees, and document retention fees. Then they’ll slap on additional charges for containers, boxes and red bags. Raise Their Prices At Any Time – National medical waste disposal companies usually add a clause to their service agreements that allow them to increase their prices by as much as 18% per year. That means at the end of a standard five-year agreement with a national medical waste disposal company you could be paying a whopping 129% more their original price quote. Guaranteed Lower Prices – Pacific Medical Waste guarantees that our prices will be 30% – 40% lower than our national competitors, for the exact same services. No Mystery Fees – Pacific Medical Waste offers “all-inclusive pricing” with no mystery fees. Guaranteed In Writing – All Pacific Medical Waste price quotes are guaranteed in writing, so there won’t be any surprises. Expensive Compliance Training Programs – National medical waste disposal companies offer effective compliance training programs, but these programs are not only expensive, you are often required to purchase a premium service program to gain access to this training. Affordable Online Compliance Training Programs – Pacific Medical Waste offers an effective and affordable Online Compliance Training Program for your entire office! Our medical waste updates blog explains in great detail, how we perform due diligence on anyone you hire to handle your medical waste. If you don’t, you could be putting your business at risk for compliance or customer service problems that may be very difficult to resolve. 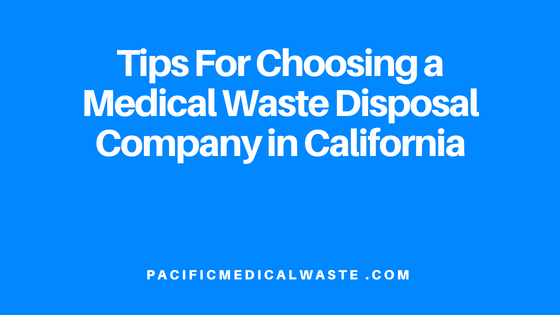 Better yet, choose a California based and licensed medical waste disposal company.